It is actually possible to quit paper completely, which has numerous positive knock-on effects, according to cloud-based document process automation solutions provider Esker. 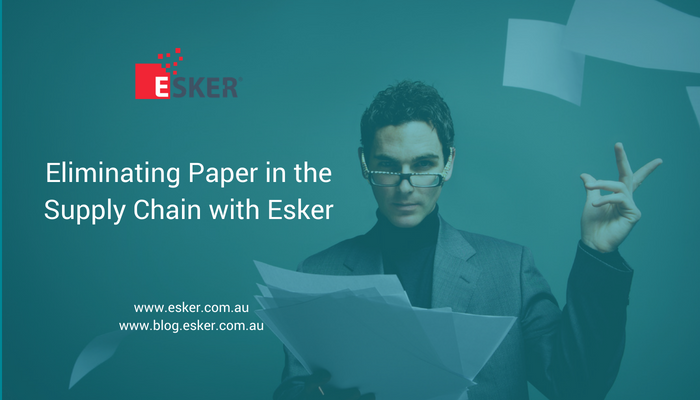 Along with doing away with the need for paper, automating every phase and type of business information exchange enables companies to reap a host of benefits in a short space of time; Esker says its solution can deliver a measurable ROI in as little as three to six months. The company, which launched as a software vendor in 1985 in France before branching into document automation, operates across Europe, North America, Latin America and the Asia Pacific, and counts global heavyweights Ericsson, Hyundai, Heineken, John Deere, Kimberly-Clark and Microsoft among its 80,000 customers and millions of licensed users. Esker’s technology enables businesses in numerous sectors to automate manual inefficiencies and low-value tasks in their order-to-cash (O2C) and purchase-to-pay (P2P) processes. “We can get orders processed sometimes 80% to 90% faster than they could do manually, so they’re getting orders in and fulfilled quickly, keeping customers happier,” Smith shares. “We’ve had many customers tell us that it’s been part of their strategy to fulfill orders the same day or within a 24-hour period. Aside from a competitive standpoint, they may offer certain goods and services that mean they have to get their products out faster, and were able to facilitate that,” Smith says. As well as reducing the time it takes to fulfill orders, going digital reduces the ecological impact a company has. It’s not often you can argue that the most efficient process in any given scenario can align with the best environmental decision, but Esker certainly makes a strong case for that, when you consider that it’s enabling a customer to send and received tens of thousands of digital documents each year, which reduces CO2 emissions and the need to cut down trees. “We certainly know that we are reducing the amount of paper in companies and that there are environmental benefits to it; we know we’re saving trees,” Smith says, before adding that, unlike Esker, saving the planet has not been a key motivator for companies. “We’re always looking at ways that we can enhance our solutions and certainly we are now with the B2G (business-to-government) initiatives in the Americas,” Smith shares, referring to e-invoicing becoming mandatory before the end of the 2018 fiscal year for companies in the US that provide goods and services to the government. “I’ve been talking about paperless for probably 30 years and it’s really been in the last five years that I’ve started to see many of the things that we talked about way back when really starting to take hold. The younger generations are used to using electronics – laptops, tablets, phones – and that’s the way that they are used to doing their daily activities. To receive something via paper seems odd to them and, quite frankly, they’re forcing people even in my generation to think differently,” he states. Asked if there is ever a need for paper, he concedes that he does find it useful to have paper documents occasionally – to look over when he’s traveling for instance – but believes “the need for paper has greatly diminished”. “We’ve all learned to get used to paperless ways of communication and we’re finding that it’s just an easier way of doing things,” he concludes.